On Wednesday I had the opportunity to attend a conference for UNL and ISU Extension Educators regarding animal rights and animal welfare and the importance of how we tell our agricultural stories to a public increasingly disconnected from where their food comes from. I learned so much and wanted to share. Dr. Candace Croney from The Ohio State University shared that animal welfare defined to most of us in production agriculture is stewardship-our animals are entrusted to us, use is acceptable, and we have the obligation to treat those animals humanely. She defined animal rights as animals have certain characteristics similar to humans (ex. mental capabilities) and thus have rights. Relationships with pets have become the new paradigm regarding how all animals should be treated. A key message driven home to me was we need to consider how we say our message. So often we position animal care as an economic issue instead of an ethical one. We say things like “We take care of our livestock because if we didn’t, we wouldn’t make any money”…so people focused on animal rights hear from that message the reason we care for animals is for profit…which leads to the next thought that if profit drops, care for the animals is potentially at risk. We instead need to address ethical issues and find ways to connect with the public meaningfully. Charlie Arnot from the Center for Food Integrity said it this way, “We need to first communicate ethics, then science, then economics”. I also have been guilty of saying “we just need to provide more education about what we do”. But that again isn’t completely correct. While the science of why we do what we do is important to us, ethics are more important to the general public. 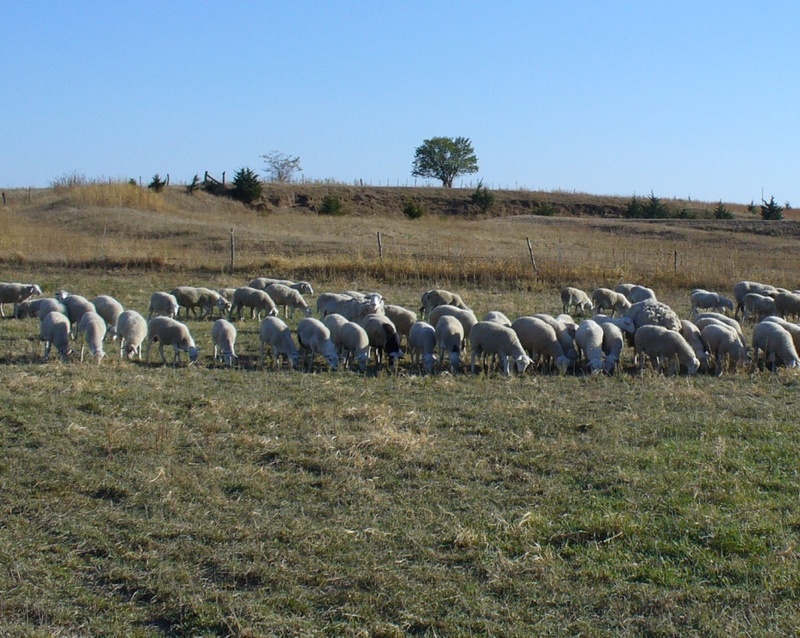 In a survey from the Center for Food Integrity, when asked what factors influence confidence that food comes from humanely treated farm animals, the fact that the producer worked with a veterinarian ranked first in increasing their confidence, but the fact that what the producer did was science based ranked dead last. Instead of first going to science, begin with showing we’re interested in doing what’s right. For instance, tell the person thank you for his/her question and that you can tell he/she cares for animals as you do too. Then go on to explain why you do what you do to care for your animals rather than provide a data dump of scientific facts. Science can be mixed in, but show the ethics of what you do first. Go beyond the traditional “food, shelter, water” as that doesn’t resonate; it’s expected as that’s what we also provide to our pets. Train people who work for you and make sure they truly do care for the animals as you train them. Determine the message for your operation. The best part is this is free; with good people it just requires a change in commitment and being consistent with your message. With the growing disconnect between the general public and where food comes from, we need to be ready to tell our story anytime/anywhere. I’ve often caught myself saying “it’s been busy” when asked how things have been going. I’ve been retraining myself to continue for 20-30 seconds explaining what I’ve been doing which usually sparks a conversation about something regarding agriculture. Part of my reason for this was to help people better understand Extension, but in doing this, I can also help people better understand production ag today. Whether it’s in the line at the grocery store, at church, at a ball game, or wherever, we all have the opportunity and responsibility to share with those around us our agricultural story because no one else can tell your story for you. As Trent Loos said in closing, “If it is to be, it’s up to me”. 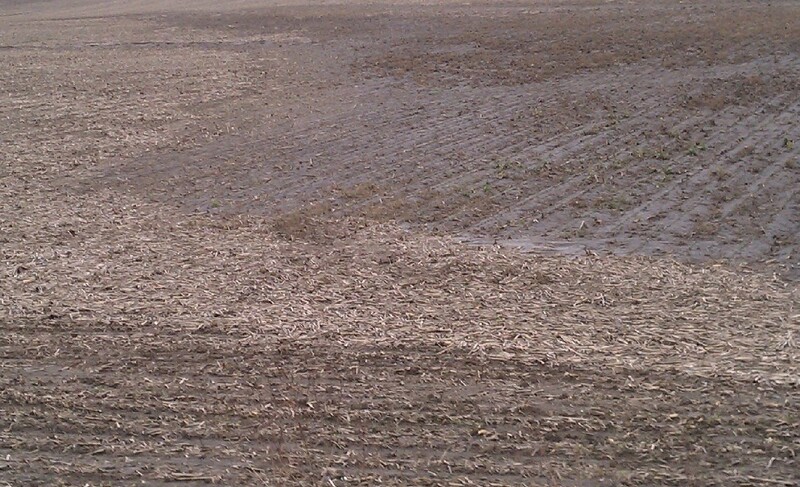 The recent rains have left their impact on fields throughout the county and Nebraska in general. 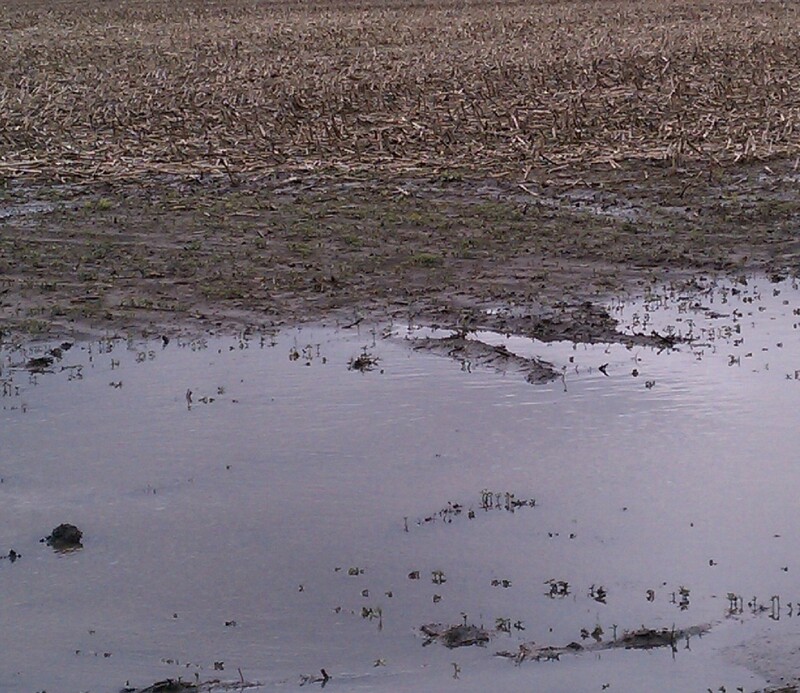 I’ve received several questions this week regarding flooded fields and how to help crops buried beneath piles of residue. For flooded fields, Bob Nielsen with Purdue University wrote an excellent article to address these concerns. In short, our cooler temperatures will help plants survive better, but plants completely submerged under water in saturated soils for more than 48 hours don’t stand much of a chance for survival. You can read his entire article here. If there’s one thing I would like to see farmers reconsider, it’s stalk chopping. It seems like every year we deal with heavy rains washing stalks from fields where they pile in certain areas of the fields burying plants, covering roadside ditches or jamming creeks. Talking to my colleagues and to several area farmers, we’ve all considered burning as an option. However, burning may only get the top-most dry material while the material underneath is still wet and won’t burn. Another farmer correctly pointed out that there’s usually so much silt intermingled with the residue that it’s hard to get a good burn anyway. Keith Glewen, UNL Extension Educator in Saunders Co. suggests you consider harrowing or possibly rotary hoeing the stalks, knowing that the depth of stalks and the period of time which elapses following a heavy rain event are important factors in determining success or failure in managing the unwanted stalks. There’s a short amount of time to get that residue off those plants if there’s no light getting down to them. In some situations in the county, residue is up to 1 ft. deep over the top of plants. Harrowing can help even out the field and emerged seedlings may be damaged, but the growing point for corn is still below ground at this point. For emerged beans, the growing point would be above ground so harrowing wouldn’t be a good option. With the rains again today and forecast for more in the future, I’m not even sure that harrowing is much of an option right now for corn as it will take awhile to get back into the fields. In places where 1 ft. of residue is burying plants and the inability to get to those piles with the wet conditions, I don’t expect much plant survival there. For now we’ll have to wait and see. In the mean time, evaluate your operation and the need for chopping stalks. If you don’t detach the stalk it won’t move. UNL on-farm research found no yield benefit to shredding vs. not shredding stalks in the research which can be found here. 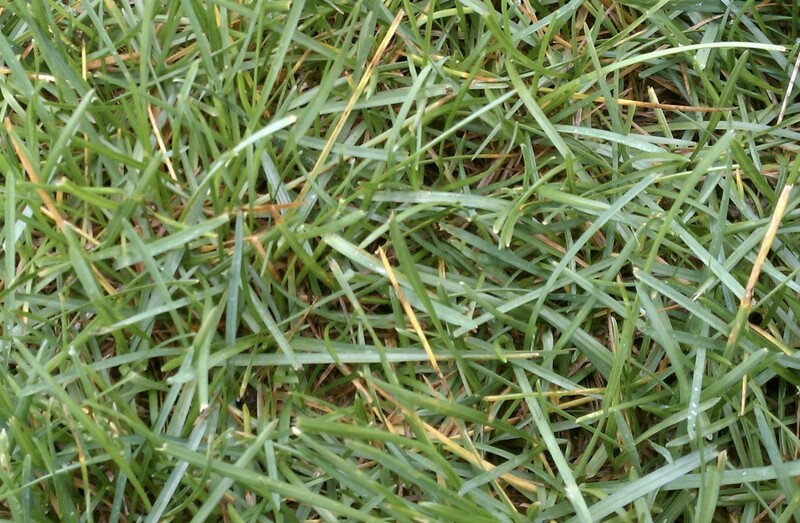 The strange weather has allowed for an uncommon turf disease to begin appearing in this area of the State. Ascochyta leaf blight typically is found in places like Colorado, but this year, it’s showing up in Clay and other areas of Nebraska. Typically the fungal pathogen is favored by hot, dry weather preceded by cool, wet weather-exactly what we’ve had up till this recent wet spell-which also favors the pathogen. Symptoms include the leaf blades turning straw colored or bleached and dying back from the tips. Eventually patches of turf may appear straw colored. It’s been a quiet year so far regarding wheat, so it didn’t surprise me when the calls started rolling in this week regarding wheat looking yellow. Most wanted to know if we had disease issues out there. Looking at fields throughout Nuckolls and Clay counties, I saw very little disease overall. That’s most likely due to the dry conditions we’ve had and the fact that many fields I looked at were wheat on corn or soybean stubble. 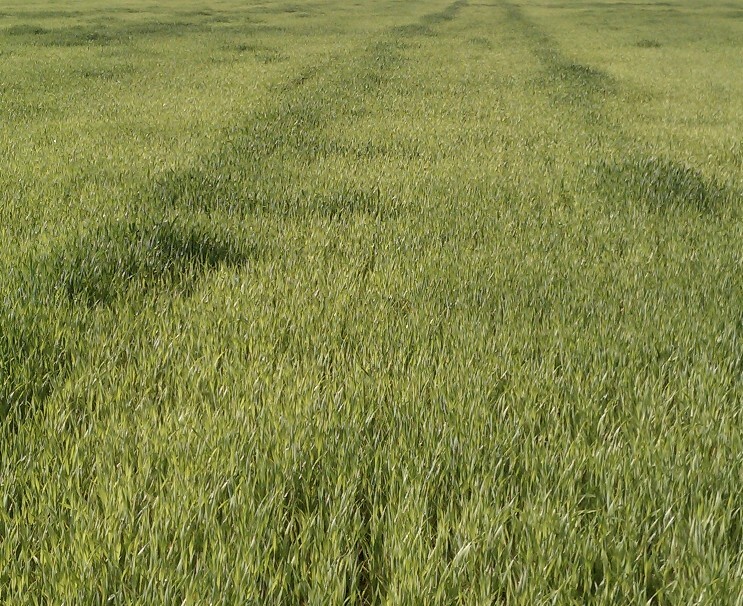 Wheat on wheat fields had disease such as tan spot or septoria leaf blotch on the leaves. I did not see any powdery mildew or rust in any of the fields I looked at. tracks showing green wheat in the wheel tracks and yellow wheat elsewhere-most likely the compaction from wheels allowed for better establishment, created a depression where moisture held, and allowed for less nitrogen loss. Fall applied nitrogen may have been lost due to the dry fall and winter. It appears that fields with spring applied nitrogen look better due to moisture this spring after application. 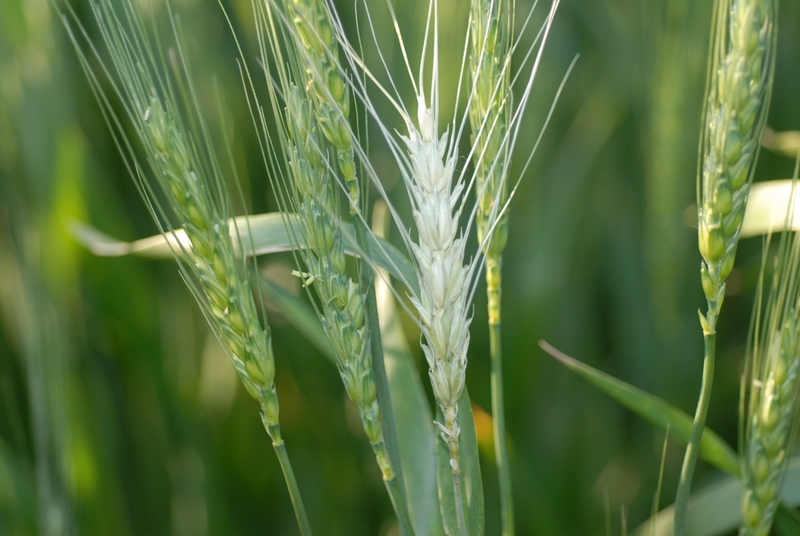 There’s also environmental reasons for yellow wheat. The cold soil temperatures may not have allowed for nitrogen release to the plants yet-we may see a change by next week. Many places in south central Nebraska have experienced dry conditions creating yellow-brown lower leaves and a blue cast to the wheat. I have pictures of wheat with ice crystals on it from some of the cold snaps we experienced. Cell rupture of that plant tissue could also have caused the yellowing of those lower leaves. Bottom line, right now there’s nothing you can really do for the yellow wheat and warmer temperatures may allow for nitrogen uptake in the future if the nitrogen wasn’t already lost. Right now there’s nothing to be worried about regarding fungal disease concerns. I’d recommend you continue scouting your fields for powdery mildew and rust and consider a fungicide application if needed (need to protect the flag leaf). I’ll keep you updated on what I’m finding in the fields! Yesterday I was honored to participate in the coolest experience ever of my Extension career! UNL Extension has been providing agricultural training to soldiers deploying to Afghanistan next month. Their mission is to help the Afghan people become more sustainable with their agricultural production and to empower Afghan people to serve as Extension agents to their local people. For more information, check out the latest edition of Nebraska Farmer Magazine and our Web site. Agriculture in this area is like turning the clock back 100 years. Wheat seed is sown by hand or with oxen or donkeys. Farm plots are 1 acre or less for the most part and families try to raise enough food to feed themselves. Residue and manure is burned for fuel. Our soldiers have quite a challenge and opportunity ahead of them! If we can teach the people to feed themselves, they hopefully won’t pursue other options of obtaining income such as through the poppy trade. Because UNL and partners such as NRCS have worked in training the military, they invited us on their Boss Lift-essentially developed to thank employers for supporting their National Guard and Reserve employees during deployments. Dr. Elbert Dickey and I rode in a Chinook helicopter, ate Meals Ready to Eat (MRE’s), and watched the soldiers go through exercises such as identifying Improvised Explosive Devices (IED’s), humvee rollovers, putting on gas masks, stopping and searching vehicles and people, and weapons firing (we even got to shoot their weapons in a simulated video game!). Throughout the day, I kept thinking how blessed I was to have this opportunity and to know the team members so well who are going-they are almost like family to me! If I feel that way through the few experiences I’ve had with them, I can’t imagine the bond formed between them while they are away at war. Extra special was the fact that I was a military wife getting to watch my husband perform the training-an opportunity wives just don’t get to partake in. It’s hard to explain the sense of pride, honor, and thankfulness one has in experiencing something like this…I have tears just thinking of it. This truly was the coolest experience I’ve ever had in Extension and I’m so thankful for the opportunity to work with this group of soldiers! I know UNL Extension will do our best to provide reach-back and answer questions they encounter once they get over in Afghanistan! It’s nearing mid-May and crops should hopefully be emerging soon! For those of you utilizing watermark sensors for irrigation scheduling, it’s important to install those shortly after emergence so you can monitor soil moisture fluctuations long before you ever need to think about irrigating. I’ve found that our cooperators who install these early after emergence are far more confident in the readings than those who install them closer to irrigation time. That’s why we no longer install these for anyone past June 15. In case you’re wondering what is a watermark sensor, it’s a 3″ sensor filled with fine sand with a fiber glass mesh around it that measures how much energy it takes for the plant roots to extract moisture from the soil. The sensor measures this in a unit of energy called kilopascals or centabars…units that don’t mean much to you or I. That’s why we’ve created charts that convert these units to inches of depletion/foot-terms with which we are more familiar! We recommend farmers install one set at 1′, 2′, and 3′ depths in their fields to monitor when their soil reaches at least 35% depletion. The basic rule of thumb based on research by Dr. Suat Irmak at UNL is to take the average of the top two sensors prior to the reproductive stages of the crop and the average of all three sensors once the crop has reached the reproductive stages (tasseling or flowering). When the average of these sensors reaches 35%, we suggest you consider scheduling an irrigation. The other tool we use are Evapotranspiration (ET) Gages. The green canvas cover mimics the leaf surface and essentially as the cover is exposed to different environmental conditions such as wind and low humidity, water is moved out of the tube through the canvas cover and the depletion is noted on a site gage on the front. This tool has helped farmers visually better understand why their crop did or didn’t use water for any given week as they can look at the ET gage and consider the weather conditions and the influence they had on what the crop used. On average, our farmers have saved 2.0-2.5″ of water in corn and soybeans since participating in this program. 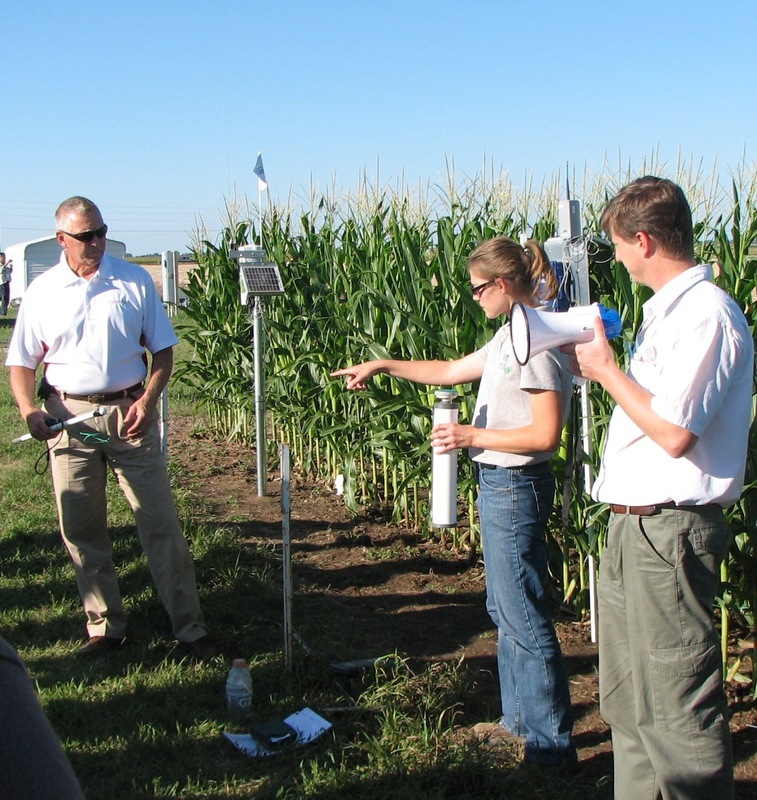 This program called the Nebraska Ag Water Management Network began in 2005 and now has over 500 cooperators State-wide in Nebraska. More information about the Network, the tools and charts I described above, and videos demonstrating the equipment can be found at: http://water.unl.edu/nawmdn. Planters have been rolling and corn has gone in the ground quickly in the past week. Please provide an update on your planting progress-and a general location of where you farm! If you are on Twitter, or even if you’re not, if you go to http://www.twitter.com and search for #plant11, you will see a variety of perspectives of how the planting season is going for producers throughout the United States. Happy Planting! Well, it’s May Day as I write this and planters were rolling late last week. 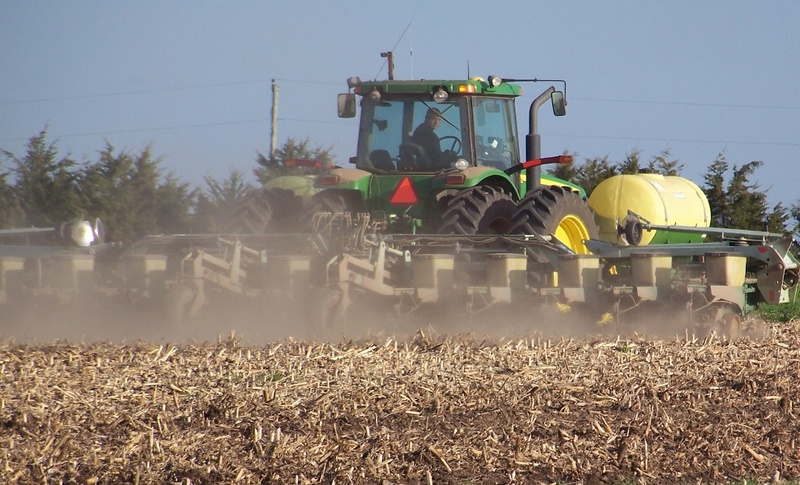 Dr. Roger Elmore provided an article regarding historical planting progress in Iowa. Finding it interesting, I chose to work the numbers for Nebraska. Many of us have been comparing this year to 2008. When we look at state-wide planting progress, we’re essentially tracking right with 2008: 9% planted the last week of April in 2008 vs. 5% in 2010. It will be interesting to read tomorrow’s report and see the change. In 2008, the average 4 days of good field conditions allowed for a jump in corn planted to 31%. With the size of today’s equipment, and the number of planters going since Thursday last week, I would expect a similar jump state-wide. I haven’t heard the question yet, but remember receiving it at this time in 2008. The question of “should I switch to a shorter-season hybrid?” The answer is not yet. Unlike soybean varieties which are photoperiod sensitive resulting in reduced yield with later planting, research has proven that corn hybrids can adjust to delayed planting dates. I found the following information from Dr. Roger Elmore and Lori Abendroth with ISU. Essentially, research from Purdue and The Ohio State University looked at early (April 25-May 10), mid (May 20-June 1), and late (June 10-15) planting dates to determine the time required (in days) from planting to silking, silking to physiological maturity, and planting to physiological maturity. What the research found was that as planting date was delayed, all hybrids in the study shortened the time between planting and silking. They also found that all hybrids, when planted late, increased the number of days between silking and physiological maturity (but the day increase varied with each hybrid). Finally, they found that hybrids change the length of time from planting to silking more than the time from silking to physiological maturity…so the corn hybrids put less emphasis on the vegetative stages than the reproductive ones. Essentially these findings show that hybrids can adapt to later planting date by changing the number of days to various physiological stages. How does planting date affect yield and percent risk of frost? I ran some simulations using UNL’s Hybrid Maize model. This model can do many things, but I used long-term weather data from Clay Center, NE to predict potential yields and frost probability based on planting date. Looking at a 113 day hybrid planted April 15 vs. May 1 vs. May 10, the frost risk increased from 10%, 17%, and 21% respectively with average yields in a “perfect year-no limiting conditions” of 248, 254, and 244 bu/acre respectively. For a 110 day hybrid planted the same days, yields ranged from 233, 242, and 243 bu/acre respectively with frost risks of 3%, 10%, and 17% respectively. Granted this is just a model and can’t predict perfectly what will happen.